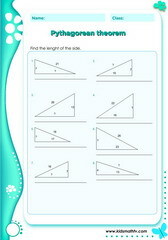 Math worksheets on the Pythagorean Theorem for children from 4th to 7th grades. 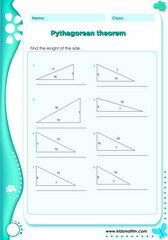 On these worksheets, kids will learn to find the base, height or hypotenuse of a right angle triangle using Pythagoras's theory. Since they are online PDF printable resources, teachers and parents are unlimited by the number of worksheets they can print as well as the times they can download. This page will serve as math tests for classroom use, extra practice for homework and mock exams for kids before class. Practice Triangle sides pythagorean theoream 6 with this worksheet. 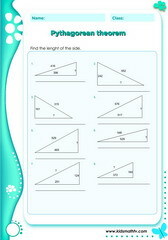 Practice Triangle sides pythagorean theorem 1 with this worksheet. 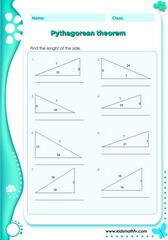 Practice Triangle sides pythagorean theorem 2 with this worksheet. Practice Triangle sides pythagorean theorem 3 with this worksheet. Practice Triangle sides pythagorean theorem 4 with this worksheet. Practice Triangle sides pythagorean theorem 5 with this worksheet. 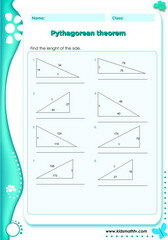 Practice Triangle sides pythagorean theorem 7 with this worksheet.